"In November 1920, Stanley Lord, ex-Captain of the notorious Californian, declared his intention to renounce his British citizenship and declare his allegiance to the United States. His sworn declaration is reproduced here. The census returns, and documents provided by the New York Historical Society and the US National Archives demonstrate that neither Stanley nor Mabel Lord lived at the stated address in 1915 or 1920. At the time that Lord was said to have emigrated to the US, he and his ship, the Anglo Patagonian, had just left St. Nazaire on the eastern coast of France. By all available accounts, Lord was still resident in England, and not New York at the time. It is not known at present whether Lord was granted the status of US Citizenship, but the fact that he lived out the remainder of his life at his abode in England suggests otherwise. This document is freely available from the relevant Court records office in Brooklyn, New York, and a copy can be found in the bequeathed papers of Stanley Lord, held at the Merseyside Maritime Museum. Why it has not been mentioned in the writings of Captain Lord's supporters, when much more trivial excerpts from Lord's life are referenced, is a fasincating conundrum!" One would have thought, from books such as Leslie Harrison's "A Titanic Myth" that Captain Lord's career post-Californian was trouble free and uneventful; indeed, he garnered much praise for his efforts in World War 2 and served with an impeccable record with Lawther Latta until his forced retirement in 1927. But this is not the case. Much diligent research has exposed gaps in the hagiographies of Lord, such as his intention to become a US Citizen in 1920. Another striking deletion from the known record of Lord's life is that his ship, the Anglo Patagonian, pictured below, was damaged in a collision in Hampton Roads on June 15th, 1915. Likely the incident had no impact on Lord's employment with Lawther Latta; he still captained the ship on its next voyage on September 12th. But a Captain is always responsible for his vessel. And the incident was significant enough to be recorded on Lloyd's Captains' Register held in the Guildhall museum in London. Did Lord withhold this information from his proponents, or did Leslie Harrison et al. ignore it altogether? To the right is a copy of an article on page 3 of the Virginian Pilot newspaper dated June 3, 1915. There seems to be some confusion over the date, as the paper reported the incident before the offical registration in Lloyd's index! Details on this incident are lacking, but research, as they say, continues! 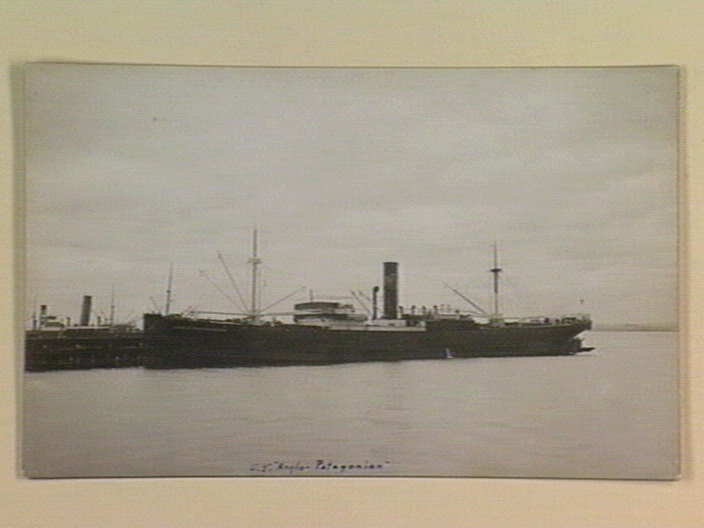 Above: The SS Anglo Patagonian.